Most asked question: How long does it take to get a custom cape? Our capes usually take 4 business days to make. 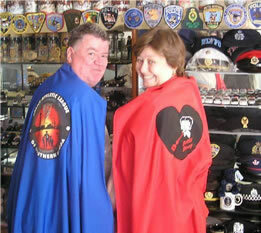 Custom capes take a little longer due to design approval from you. 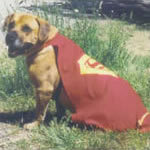 After that, it depends on your shipping method of choice, and the final destination of the capes (we're in California). Second most asked question: How big are the capes? 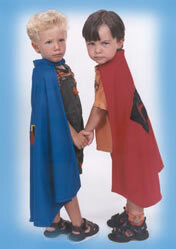 Kid capes are 28" long with a 17" neck. Teen capes are 41" long with a 22" neck. Grown-Up capes are 56" long with a 22" neck. 3. Are the capes washable? Yes. Capes and thread are made specifically for durability and washability. The capes are 100% polyester. The magnets are high-quality neodymium-iron-boron (NdFeB) rare-earth magnets. 5. Will the magnets stick to the inside of the washer and dryer? Maybe. Most washers and dryers have an aluminum drum inside. However, if you have a stainless steel drum, as many of the new washers and dryer do, the magnets will definitely stick. This does not seem to be as much of a problem in the washing machine as in the dryer. If you have a stainless steel dryer drum, we suggest air-drying. They are polyester, including the embroidery thread, so they do not take long to dry. 6. Why do the capes have magnets in the collar? Many reasons! They are cool! Watching people put on the cape for the first time and seeing their eyes light up when they realize the magic of the magnets is fun. Watching kids trying to figure out why the cloth sticks to each other brings a smile to your face. On the serious side: They will come apart if the cape gets caught in something unlike a cape that is tied on, which could be a choking hazard. Children can put the cape on "all by myself," without help from an grown up. AND THEY'RE COOL! 7. Why not just use Velcro for the collar? Children put their capes on and off and on and off. Velcro will wear out with this kind of use. It can also be stiff and scratchy. Magnets are not stiff and scratchy, and will not wear out with constant use. And did we mention THEY'RE COOLl? 8. Will the magnets wear out over time, and are they dangerous? No, the magnets will not wear out. Although our magnets are strong, the largest magnet we use (0.5" x 0.125") has a magnetic field of only a few inches. However, according to Rare Earth, individuals with pacemakers or internal medical devices should not handle strong rare-earth magnets. Studies have shown that magnetic fields can affect the operation of these devices. Strong rare-earth magnets should be kept at a safe distance from individuals with these devices. The Rare-Earth Magnetics Association is not aware of any positive or negative health effects from handling rare-earth magnets. We however recommend that pregnant women not handle very strong rare-earth magnets as a precaution. John E. Moulder, Ph.D., of the Medical College of Wisconsin has produced a comprehensive overview of the heath effects of static magnetic fields that we encourage our customers to read. This article is referenced by the World Health Organization as information for the general public on static magnetic fields. 9. Can I iron the cape? Yes. You won't need to iron the cape unless it gets stuck to the sides of the dryer. If you need to iron it, make sure you use a low setting. Using a little steam is helpful. Do not iron the screen printed logo at the bottom - it will melt! 10. Is all the embroidery done by hand? ...by hand? I guess no. We use an embroidery machine. Do we outsource the embroidery? No. It is all done here, by us. 11. What colors do you have? Capes: Red, Blue, Black, Green, Yellow, Purple, Hot Pink, Dark Green, Orange, Brown; Medallion: Red, Blue, Black, Yellow, Green, Purple, Hot Pink, Light Pink, Dark Green, Orange, Brown, White; Thread: Red, Blue, Black, Yellow, Green, Purple, Hot Pink, Light Pink, Dark Green, White, Orange, Brown. 12. My child is only two years old, are these capes a little big? No. Our capes are made to be floor length for the average sized 2 year old. However, 2 year olds do not seem to fall (any more than normal) because of the couple of inches that the cape drags on the ground. 13. My child is large for his age, will the neck fit him? Depends. Our neck size is 17", more than enough for a bigger child, and the magnets are adjustable in the collar. 14. Can I get a cape with a different length or width? 15. Do you have grown up sizes? Absolutely. We make grown up sizes in the same quality as our children's capes. 16. What ages do you recommend the capes for? Two to Two-hundred. Once a cape kid- always a cape kid. We find that boys live in their capes from about 2 to 5 years old. Most boys will continue to wear their cape till 7 or 8, but in "secret" at home. Then they start becoming interested in capes again after 20 (you can take the boy out of the cape, but you can't take the cape out of the man). Girls seem to wear capes right through high school. They don't "live" in their capes like boys do, but they aren't as embarrassed as they get older. 17. Aren't these just for Halloween? NOT ANYMORE!!! These capes are toys in the purest sense of the word. A toy that sparks the imagination, increases self-esteem, and be a great source of empowerment to a child who mostly has no control over things in the world.